The ECM Quality is an advanced crate washer designed to clean up to 2,500 crates per hour, with medium to heavy soiling. Several additional component can be added onto this Crate Washer, depending on the industry and on the type of soiling that needs to be removed. In case you (also) want clean products wider than 650 mm, the machine can be built as a Combi-model. Therefore, it’s possible to wash both crates and pallets. 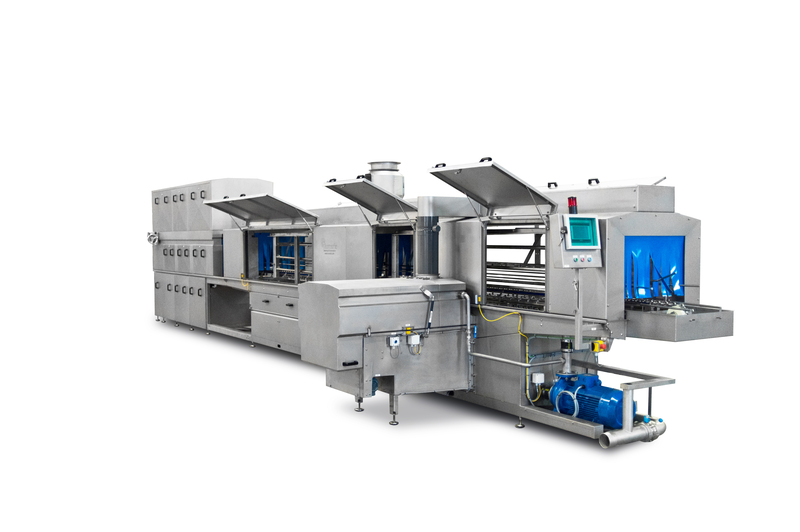 In addition, the Combi-model is also suitable for washing baking trays and other wide product carriers which can’t be implemented in a standard model. In case you want to reach a higher capacity with the ECM Q, or your logistic process within your organization requires it, it’s possible to build the machine in a double-track model. This double-track machine is extremely flexible, because both tracks are driven separately and have their own spraying package and pump. This option can also be chosen to be ready for potential future growth of your company without purchasing a new machine. If, in addition to crates, you also want clean ‘flat’ products or lids, it’s possible to build the machine in a Totes and Lids version. In this type of crate washer a lid track and crate track are built in the machine. By using this model, the crate and lid can be washed at the same time and run parallel during the production process. Do you want to talk about the Eco Clean Master Quality? You want more information about Eco Clean Master Quality?